Which subjects do you currently study, and which is your favourite? I’m studying for a few different A-Levels at the moment, but my favourite is definitely accounting – and I’m not just saying that because I’m on this program! It’s new to me, but I’ve already learned so much, as it’s so relevant to everyday life. How did you first hear about Access Accountancy, and what did you need to do get involved? My sister first told me about the program – as well as a few others – whilst I was looking for work experience to do at school. The application was pretty easy and all I had to do was fill out a short form, followed by a friendly phone interview with RSM’s HR assistant, Scarlett. She was really nice and just wanted to know a bit more about me and why I might be interested in trying out accountancy. There were no academic requirements, I just spoke about why I wanted to do it – and that was mainly to see what accountancy is all about. It’s really open to everyone. Why did you want to join the program? As my favourite subject, I was interested in accounting as something I might want to pursue as a career one day, only I didn’t really know much about what it was really like or what my options into it were. My thinking was that if I got some experience in a firm I could then get a better understanding of how it really works. Then I could decide whether I would study it at university or do another type of higher degree. This was therefore a great opportunity for me, and I was very excited to take it. Did you know much about the accountancy profession before? How has this changed? I thought it was just about numbers, staying all day in an office and checking accounts, but I learnt it’s so much more than that. It’s dealing with clients, it’s building relationships, it’s exploring certain industries… it’s really so varied, and a crucial part of how businesses operate. What did you do on the program? I was on the program for a week, from Monday to Friday, where we spent each day getting to know the different departments. The first day was mostly just an induction, followed by an introduction to corporate finance. On Tuesday we were given an overview of internal audit, each going to different places (I went to Ealing Hospital in west London). On Wednesday we learnt about marketing and ABA, and their role within accountancy. Thursday was about using Microsoft excel, and learning how the audit department checks accounts to make sure data is valid and precise. On Friday we attended a CV writing and interview workshop, where we were given guidance on how to prepare for interviews within the industry. What did you think about the program and what have you enjoyed most? It’s a really friendly and relaxed working environment, and very different from just sitting at a table in a classroom at school. It’s much more hands-on, and I found that that not only helped me better grasp what I was learning, but made me more enthusiastic about this kind of career. I think I got a great insight into accountancy, and it’s really helped me figure out what it is I want to do and how I can do it. Before I thought that you had to go to uni to get an accounting degree, but I learnt that you can do courses like the AAT and ACA so don’t need to. At school I was given advice about my CV, but it hasn’t been as tailored and useful as it has been on the Access Accountancy program, because these are people who are professionals in the industry, and they know what you need. The whole experience has made me feel really prepared for the future. Has the experience changed your future plans? Yes, it’s definitely opened my eyes to my options. Now I know that I can still do what I want to do without getting into a lot of debt, I am seriously considering the possibility of not going to uni and taking the school leaver program route. I am currently studying A-Levels in Business, Economics and Maths. My favourite subject is probably Economics because, as a broad subject that feeds into so many areas, it has aided me in making informed opinions on all sorts of topics – for example, Brexit. How did you first hear about Access Accountancy, and what did you need to do to apply? I was looking online for work experience to do for school in June but came across an opportunity with Access Accountancy to do a program during the Easter holiday. I thought this would be a good time because it wouldn’t conflict with my studies. My mum – who is an accountant - already knew about AA, and she told me that it was a great opportunity because, when she was younger and keen to try accountancy, there weren’t the same options. I just had to fill out a short online application form and then have a casual telephone interview with (RSM’s HR assistant) Scarlett, who spoke to me about why I wanted to do this - and that was the final stage. I’m pretty good with numbers and I thought this was the sort of career I might go into one day, so it seemed a good fit for me. It was also the reputation of the firms involved, which I thought would look great on my CV. When I researched their culture I particularly liked that there wasn’t much of a hierarchy in their leadership or in their student access philosophy. As in, the process wasn’t too demanding in terms of entry requirements, and they’re open to giving everyone a fair chance - no matter what your background is. Did you previously know much about the accountancy profession? How has this changed? I knew about a few of the big name firms, but I didn’t know much about what they did. I also knew about the necessary exams and the main progression routes, but I didn’t know what sort of roles people could have within the profession. I thought it would mostly be about numbers, but I’ve since realised that there are all these different narratives for each of the sectors and the departments that run them. It’s so interesting to see how the areas all interact with one another to support clients. What have you enjoyed most about your experience so far and what have you learned? Being in a client’s offices at the NHS Trust to understand internal auditing was really interesting, and definitely gave me some perspective on how varied a role in an accountancy firm is. I wasn’t initially interested in audit, but it has really given me an insight into opportunities within this department. I also learned a huge amount from work shadowing, which was extremely helpful in giving me a real life example of job tasks on a day-to-day basis. I would have liked to do more hands on activities to get a more practical experience of the role, but I think the program would probably have needed to be longer. Has the experience changed your plans for the future? 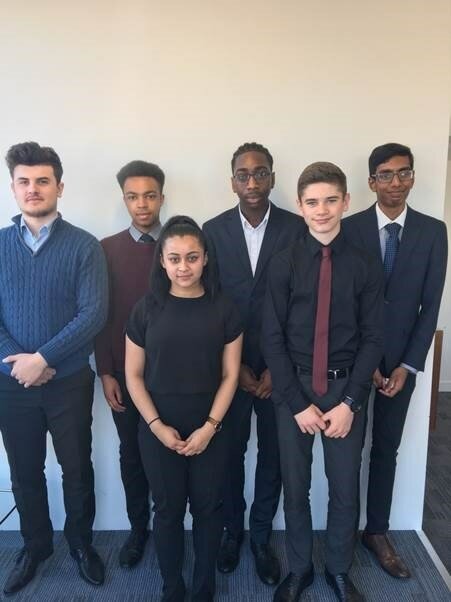 I gained insight into the school leaver program and how it’s another way to get into accountancy without going to university. I actually had a vague initial understanding of what it is but I didn’t realise that it was equal to a degree. I’m now definitely thinking about taking this route, where I can get some real work experience whilst I study. I previously studied A-Levels but then changed to study BTEC business, which is an eighteen unit course equivalent. My favourite part of my course is studying accounting because it covers many different fields, and is a really important part of business. I wasn’t aware of the program until my teacher mentioned it to me. He overheard me saying that I wanted to be an accountant one day and recommended that I should try this scheme out. Work experience wasn’t offered directly through my school at the time, but he said he had a contact who was a partner at RSM and she would be able to help me arrange it. Through her I was given the email address of Scarlett, the HR assistant at RSM. I contacted her and she sent me an application form to fill out. That was about all I had to do. I’ve always wanted to be an accountant, so I hoped it would give me a chance to see what the job is really like. Did you previously know much about the accountancy profession? What have you learned? I felt I had a good basic understanding of what accountancy is before joining the AA program, but not enough to fully appreciate all the different accountancy roles and how they tie into so many other areas I would never have considered – like hospitality, tech or construction. We got to spend each day of our AA week trying out a new area of the business to see what it is they do, and this included everything from work shadowing to meeting clients and practical taster tasks. People often talk about how accountancy is boring and office-based, but they couldn’t be more wrong. Sure, people do spend time in an office working on big reports with data, but sometimes these can be for high profile celebrities and companies, or important risk assessments of public services (e.g. healthcare) that will make the headlines. They’re not always in the office either; they’re often travelling around meeting clients or colleagues within their sector. The opportunities for movement within a firm are also really good and the whole environment is very supportive. I’ve gained a real insight into this world and can now say that it’s certainly not boring! Before the program my post-sixth-form plan had always been to go to university and study Accounting, but now my eyes have been opened to the fact that there are other ways to do this. Even though I still do want to go to uni, my AA experience has made me think that I should probably do the AAT or ACA course with an apprenticeship first. With that combination of learning and earning I can be saving up money to go to uni later on if I still want to. I worry quite a lot about the future – about being in debt and not being able to get a job, for example – so this plan would probably help with that. I also think going to uni later would improve my chances of getting better grades, as I’d be less likely to get caught up in the student party culture. I study A-Levels in Physics, Economics and Geography, and am also doing an EPQ. I enjoy Economics the most, because it deals with day to day business issues in the wider world that affect all of us, both socially and politically. I was quite determined to get some financial work experience either during the school year or in my summer holidays, so I searched all over the internet for pre-undergraduate schemes within all of the professional services. I have a family member who works as an accountant for Lindt and he recommended to me that I give Access Accountancy a go to get some valuable firm experience during the Easter holiday. I found the website and filled out a simple form online. I then had a phone call with the HR assistant of RSM to talk about the program, before being invited to join the group with five others. Without a doubt I want to work in either accounting or banking, so I wanted to try out a few different schemes to get a better sense of what each do and whether I would like them. Access Accountancy provided an easy opportunity for me to do this, and it was at a good time that didn’t conflict with my other planned holiday scheme at a bank. I previously wanted to be in financial auditing, so I did quite a bit of research into the area beforehand, but I’ve definitely been able to better see how my theoretical knowledge of it works in the real world, and all the related areas of accounting. However, what I didn’t know was the name of different accounting firms and what each of them does internally. This has been really helpful to me in thinking about the kind of company I want to work with, especially as it shows they are quite accessible and not intimidating. I also didn’t know there was a school leaver program that meant you could receive on the job industry training whilst you earn money, without needing to go to university. I think there are a lot of people who don’t realise that this is the case. I know I want to work in finance in some way, and that hasn’t really changed after completing my AA week, but I feel better prepared for what I’m going into and I can now make an informed decision when weighing my accounting experience up against my banking scheme. There is also a strong possibility I will also do the school leaver program instead of uni, but I’m still undecided so I’ll have to let you know.